Cashew Chicken is a big favorite at our house. We love a good takeout fakeout at home. It’s so much tastier and healthier than what you can get at the local Asian restaurant. 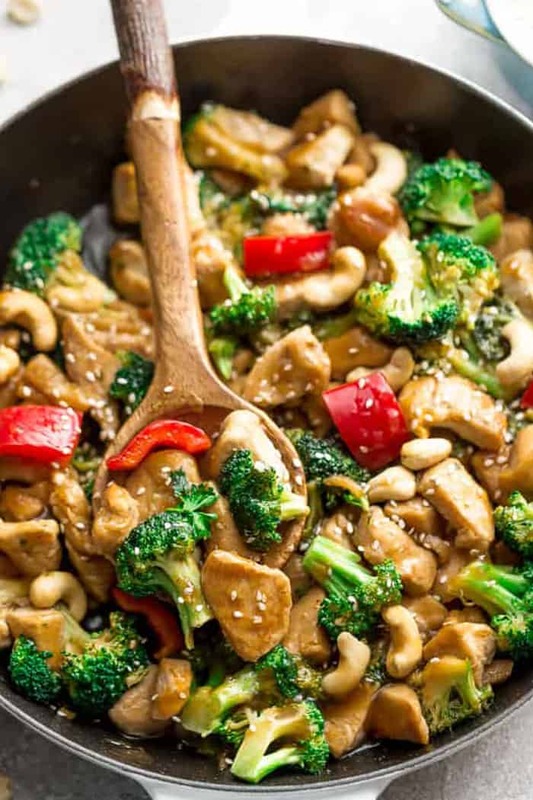 My son is crazy about cashews so this easy one pan stir fry happens a lot at our house. Do you guys have an Instant Pot? It is my all time favorite kitchen gadget right now. 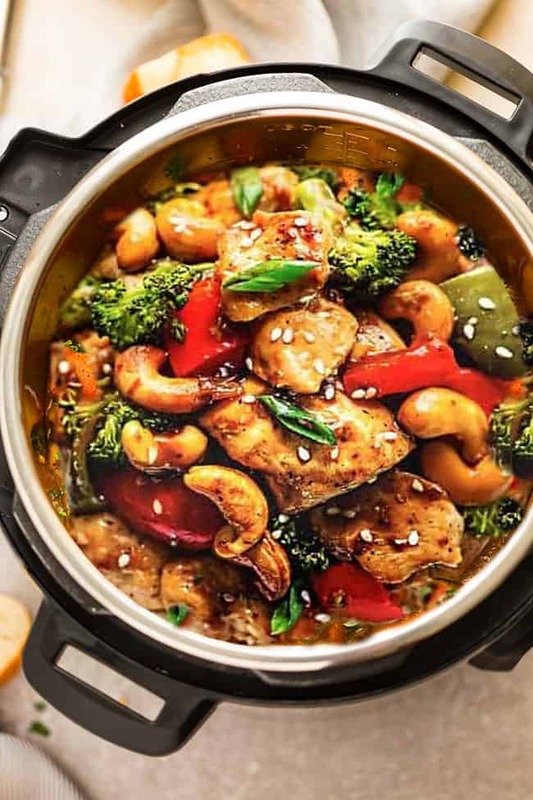 This Instant Pot Cashew Chicken has all those classic flavors of our cashew chicken stir-fry recipe with instructions for making it in the pressure cooker. And if you’re following a low carb or paleo diet, I’ve also included notes and options so you can still make this fit into your healthier way of eating. 3. 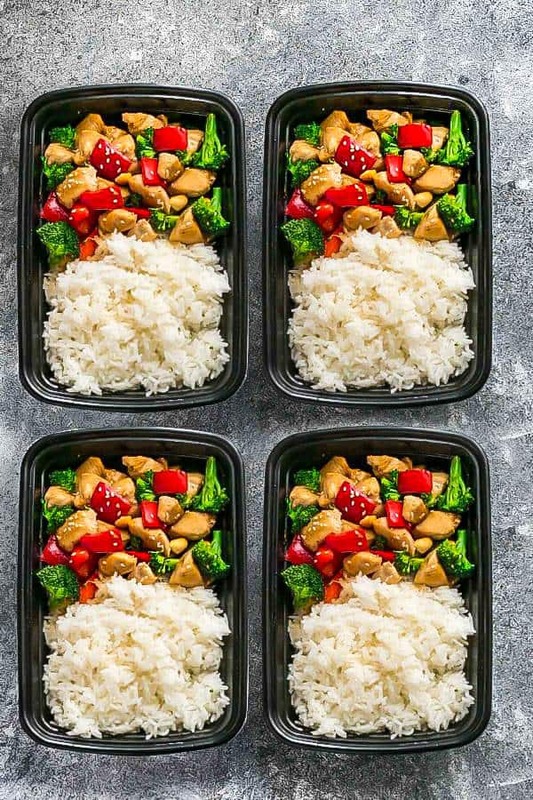 Chop your broccoli, red bell peppers and any other vegetables you like while the chicken marinates. 4. Turn on your Instant Pot and press the SAUTE button. Add oil when hot then brown the chicken for about 1-2 minutes Add the sauce and cover with the lid. 7. Once all the pressure is released, carefully unlock the lid and transfer the chicken to a plate. Press the SAUTE button, then stir in the arrowroot starch (or xanthan gum) slurry into the Instant Pot along with the vegetables and cashews. 8. Allow to cook for 3-4 minutes until the vegetables are tender and the sauce has thickened. Adjust seasonings and add more water as needed to thin out. Give everything a final tossing to coat well. 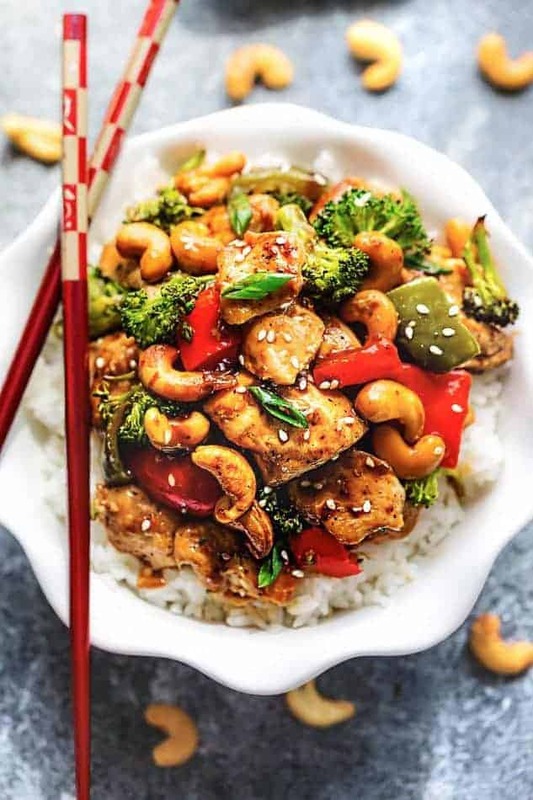 WHAT CAN I SERVE THIS INSTANT CASHEW CHICKEN WITH? The great thing about this healthier than restaurant version is that you don’t have to serve this cashew chicken with white rice if you are trying to watch your carbs. Quinoa, spiralized zucchini noodles or cauliflower rice are all delicious options that would be delicious with this cashew chicken. 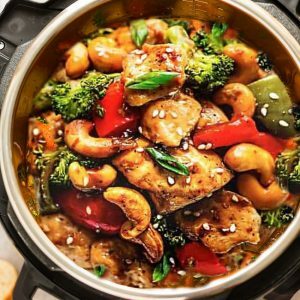 CAN I MAKE THIS INSTANT POT CASHEW CHICKEN AHEAD OF TIME? If you plan on serving this with zoodles (paleo), quinoa or steamed rice – those can easily be made ahead of time too and stored in the fridge. Instant Pot Cashew Chicken Stir Fry - a popular Chinese takeout favorite made easily in the pressure cooker in under 30 minutes! Easy to customize and perfect for busy weeknights. In a medium bowl, combine the tamari, hoisin sauce, sesame oil, sweetener (if using), vinegar, ginger and garlic for the sauce. Set aside. Add the vegetables and cashews and cook for 4-5 minutes, or until the vegetables are crisp-tender and the sauce has thickened up. Adjust seasonings with salt, pepper or red pepper chili flakes an / or add more water as needed to thin out sauce. Give everything a final tossing to coat well.